The LPA Today magazine is the official publication of the Little People of America, Inc., (LPA) and is a benefit of membership in LPA. Published once a quarter, its goal is to provide a wide range of LPA news, opinions, photos and feature articles written by members. Are you getting your magazine? If you are sure that your membership is current and you have not been receiving a copy of the LPA Today, please contact the LPA office at 1-888-LPA-2001 (direct, 1-714-368-3689) or [email protected]. Part of what makes LPA Today such a benefit to LPA is its capacity to be a forum for feedback. Whether you have an opinion about something you have read or seen in a previous issue, or you just want to make readers aware of a specific issue, please submit your thoughts as a letter to the editor. Letters should include your name, address and phone number for verification. Publication will be determined by the editor and may be edited for length. LPA Today welcomes written contributions whether it be a topical news item, District or Chapter happenings, a personal essay, book or movie reviews or announcements. Also! Don't forget about the pictures! Art is just as important in telling a story. All photos MUST be high resolution (at least 200-300 dpi) for publication. Photos used on a website (72 dpi) are too low and therefore cannot be used. If you would like to contribute something or just have a question or comment, please contact us at [email protected] or Cuquis Robledo, Public Relations Director at [email protected]. 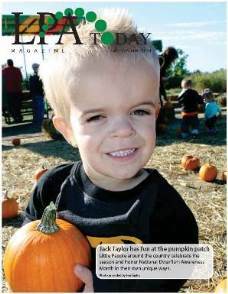 The LPA Today is the magazine of the organization Little People of America. LPA is a non-profit membership organization that offers information and support to people of short stature and their families. LPA solicits advertisements for LPA Today that support the goals and message of Little People of America, and that are useful, informative and relevant to the LPA Membership.